Using a carafe or decanter is not obligatory, but it may allow you to fully enjoy all the tasting sensations your wine can provide. 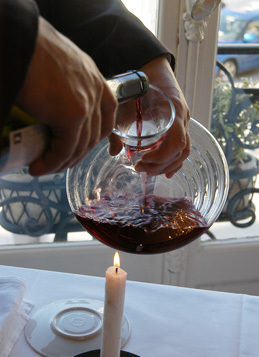 If the wine is very young, or somewhat “closed”, unlock all its aromatic depth by decanting it to aerate it. If you are drinking an old wine, decanting will liberate the secrets it conserves. To fully discover the qualities of a young wine and to enhance your tasting pleasure, you can transfer it to a carafe. This will aerate (or oxygenate) the wine during pouring, which frees the aromas and will make the wine more supple. They contain tannins (found in grape skins) which can be very dominant in tasting. They can give a wine an astringent, harsh taste, which can be softened by exposing the wine to air. Generous and full-flavored, these wines have a wide aromatic palette. By aerating them, you will unlock this profusion of aromas. It will also temper the intensity of the oaky notes derived from maturing the wine in contact with wooden barrels. For successful oxygenation, select a wide carafe, which provides a large surface for aeration. Pour in your Bourgogne wine, letting it run down the side of the carafe. 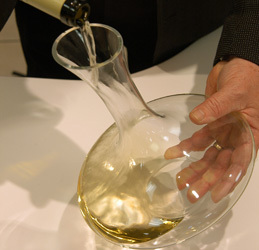 Unlike the solemn and meticulous technique of decanting, transferring wine to a carafe can seem rather rough. But don’t worry; Bourgogne wines are made to be kept for a long time and sometimes need to be “shaken up” to be appreciated in their first flush of youth! Next, let your wine relax for a couple of hours. Gradually, in contact with air, it will open up like a delicate flower, revealing all its aromatic depth. Are you planning to taste an old wine ? To release the full subtlety of its bouquet (odors), decant it before serving. Decanting is a method of transferring the wine from its bottle which gently aerates the wine, while at the same time leaving behind any deposits. It requires great delicacy, like the aromas which it helps to liberate. To avoid losing any of the qualities of your Bourgogne wine, carry out this operation just before tasting. Thanks to this technique, you will appreciate the full diversity of older wines, allowing you to enjoy a unique experience.